To make the soup: I don’t have a steamer so I made a make-shift one. To do so, take a strainer/sieve and place it atop a medium saucepan that’s filled with about 3 to 4 inches of water. Turn the heat to medium and add the cubed celery root to the strainer/sieve and cover. Cook for about 15 minutes and then add the pear. Cook for an additional 10 minutes. If you have a steamer, you are fancy; feel free to use it. Add 1 1/2 teaspoons salt and pepper; give it a taste. If you like you can add the additional 1/2 teaspoons of salt (I did!). 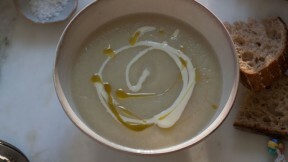 Divide amongst bowls and top with a drizzle of saffron oil and creme fraiche.